A few of the things I get asked often is "how did you get so good?" or "Can you teach me to draw like you?". My answer is usually the same- you just need to practice. Everyday. For years. There are no shortcuts in this. I don't draw everyday, but now I will. I just need to show up. 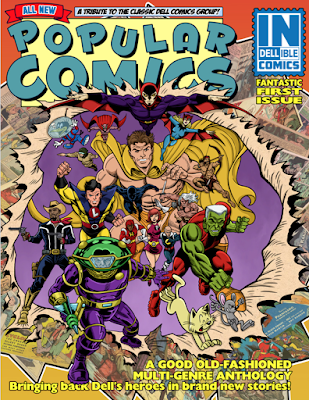 The folks at inDELLible have published the first anthology TPB, calling it Popular Comics, Issue #1. I have a 5 page story inside written by Bill Cain called Captain Tornado. I only pencilled and inked the story, colors were by Jared Prophet and it was lettered by industry veteran Daerick Gross, Sr. Cover is by the legendary Steven Butler! It's available on Amazon. Daerick also acted as the art director of the project. He has been great in giving advice and critique and I feel like my artwork has been evolving under his guidance. I originally had a second story, but life intervened... however something will come of it! Stay tuned! Bought a brush pen... leaving comfort zone. I hadn't posted for a while, so this update is more of an attempt to say "yep, I'm alive and busy behind the scenes!" 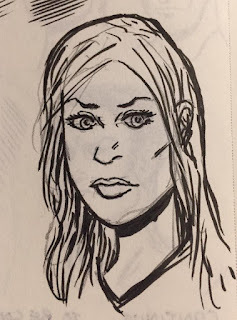 Here's a head study I executed with a brush pen... mostly to see what kind of tight control I could have with details. The image is about three inches tall, to give you some frame of reference. I've been drawing for years and have played with brushes off and on. This is the first one that turned out halfway decent enough to show off. I bought a small round Pigma brush pen from Hobby Lobby (not endorsing the store, but it's nice alternative to Michael's. I've played around with a sable and Higgins ink before- but really only about 3-4 total work hours messing with a brush in all my time doing it. I'm not a fan of clean up so I've never really hassled with it. This one was after about a half hour of inking different heads. I need to start posting current images!